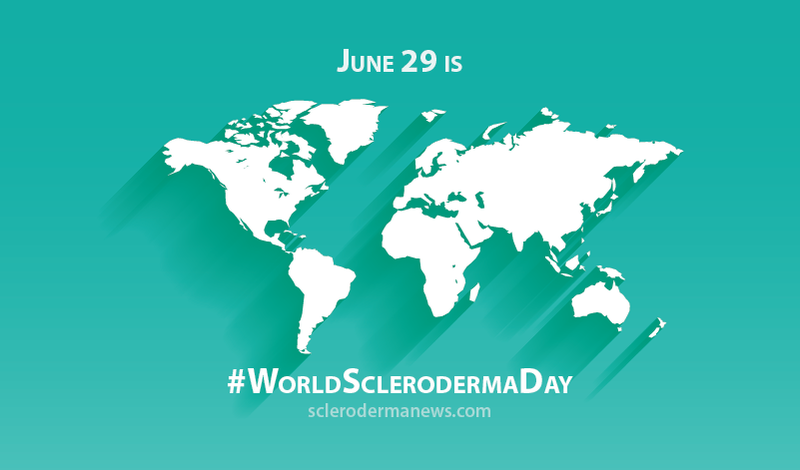 Wehoo, Thursday, June 29, is World Scleroderma Day. 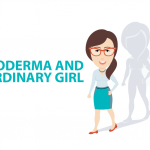 This is our opportunity to showcase the rare disease scleroderma to the world to raise awareness — whether it be for fundraising purposes, for investment in research for that oh-so-desired cause and cure, or awareness for educational purposes. 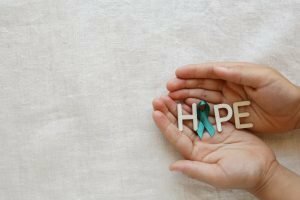 This is our day to put the spotlight on the rare disease that we live with 365 days of the year with no holiday break, with hope and pain as our constant companions. June 29 commemorates the date when the gifted Swiss-German artist Paul Klee (1879–1940) died. Ten years after his death, Klee is believed to have been diagnosed with diffuse systemic sclerosis. I discussed this in more detail in a previous article. 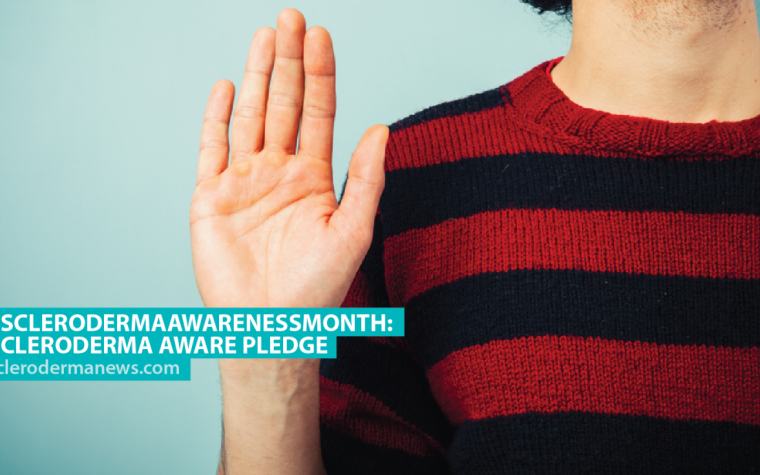 This year, my June Scleroderma Awareness Month campaign has been focused on Patient Profiles from all over the world, highlighting best practice and management of the scleroderma patient, along with current unmet clinical needs. I have combined these requirements with the focus on current medical research and will be providing an overall outcome in due course. These golden hallmarks run parallel to medical research being at the nucleus for optimum management and prevention. 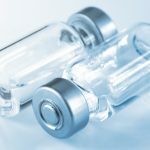 By understanding the biological processes as to why the immune response is triggered in the first instance, for the body to then manifest such symptoms, will most certainly reduce the lifetime burden of this disease. Financial investment in medical research, along with global collaboration of progress in understanding, is paramount. 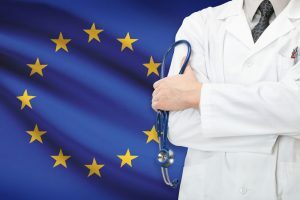 The launch of the Journal of Scleroderma and Related Disorders (JSRD) at the 4th Systemic Sclerosis Congress last year is a welcome advancement in the sharing of scientific research data and understanding. 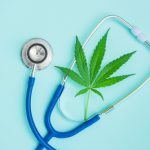 The contents of the journal, as shown by the current five issues, indicate the current clinical research focus areas for the entire holistic scleroderma experience. The 5th Systemic Sclerosis World Congress takes place Feb. 15-17, 2018, in Bordeaux, France, where the latest research data will be presented. Like last year, there are many events being held worldwide, varying from “‘out and about” walk in the park activities to virtual walk social media participation. Our friends in Canada continue to set the bar high for the rest of the world with their scleroderma awareness-raising. They are lighting up Niagara Falls again this year in blue and the Peace Bridge in teal. If you cannot experience this in person, you can watch it live via the Scleroderma Canada Facebook Page. 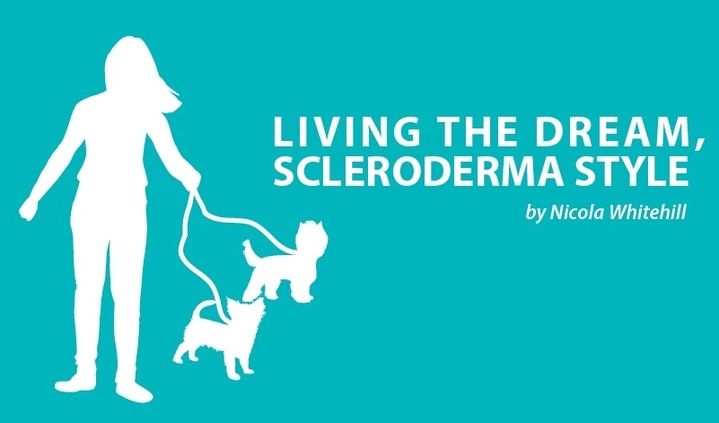 Although I admit it’s not nearly as thrilling as seeing Niagara Falls, I will be presenting it live here on the Scleroderma News Facebook Page. Please comment below if there are any topics in particular that you would like me to discuss. 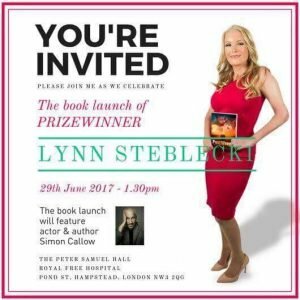 Long-term diffuse systemic sclerosis patient Lynn Steblecki is holding her debut book launch at the Royal Free Hospital for medical research. I am very excited for Lynn and wish her every success. Huge thanks go to U.S. patient Sharon Esposito for sharing her wonderful creativity in making her scleroderma awareness images available for all of us to share. 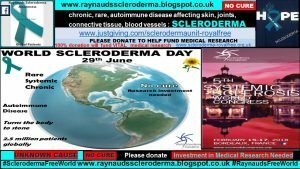 World Scleroderma Day 2016 — just a year ago — was a very busy day with activities and events taking place all over the world, as well as a very busy June Scleroderma Awareness Month 2016. 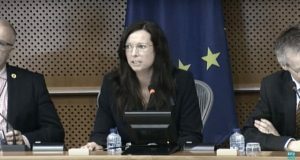 I had the pleasure of being a presenter and part of the European cohort who gave a presentation at the European Parliament in Brussels in honor of World Scleroderma Day 2015. I am immensely grateful to James Carver, MEP, for organizing this event in memory of his late wife, Carmen, who sadly passed away from scleroderma. 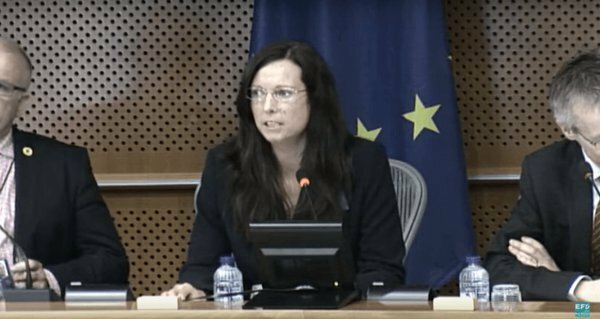 Columnist Nicola Whitehill speaking at the European Parliament on World Scleroderma Day 2015. I had not been abroad for over a decade prior to this trip, and my seven-week bed rest following the trip was a harsh reminder as to why I had not been away for so long! However, the experience remains one of my few patient highlights of the last 20 years. 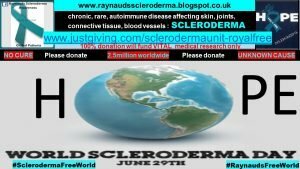 Please DONATE to help fund medical research at The Scleroderma Unit, where 100 percent of all of your money will be used for medical research purposes only. Thank you. Follow Raynauds Scleroderma Awareness Global Patients Facebook Page for latest updates. 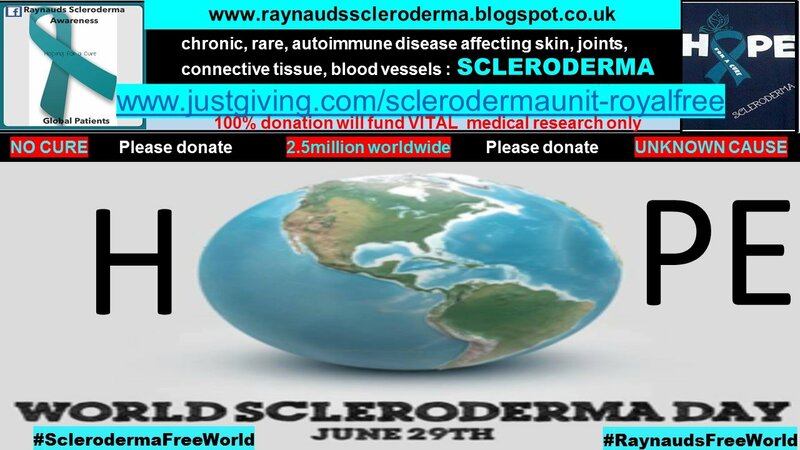 Tagged 29th June World Scleroderma Day, Raynaud's, Research, rheuamtoid, SCLERODERMA Awareness Month, SclerodermaFreeWorld, unmet clinical needs. 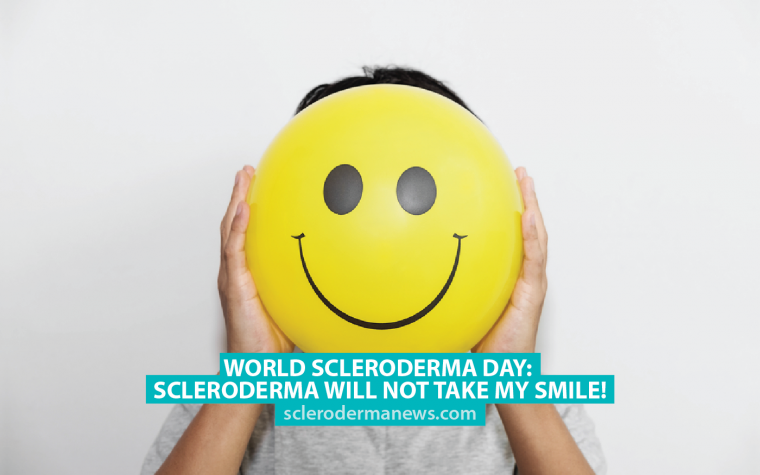 Next:World Scleroderma Day: Scleroderma Will Not Take My Smile!